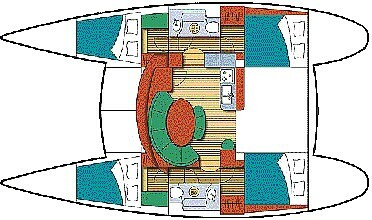 Length Overall : 37' 11"
The Lagoon 380 is the product of many years’ experience and research. Blue Tooth has proven to be reliable, fast, easy to handle and comfortable both at sea and at anchor. 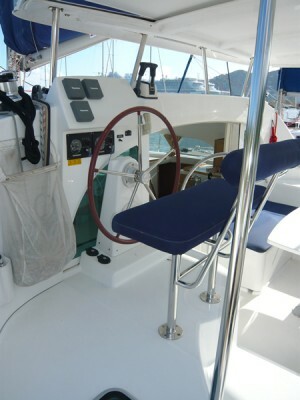 With a roller furling genoa, main with stack pack, control lines leading back to the cockpit and an electric winch for the main, the Lagoon 38 is a pleasure to sail. 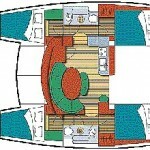 To view a video of the Lagoon 380 CLICK HERE. This video is provided by Lagoon and does not depict Blue Tooth herself. Her curved salon, fitted with large bay windows, connects directly with the cockpit, and provides a panoramic 360 view. The salon has upholstered cushions and a large dining table, an ideal setting for a dinner party of 8. 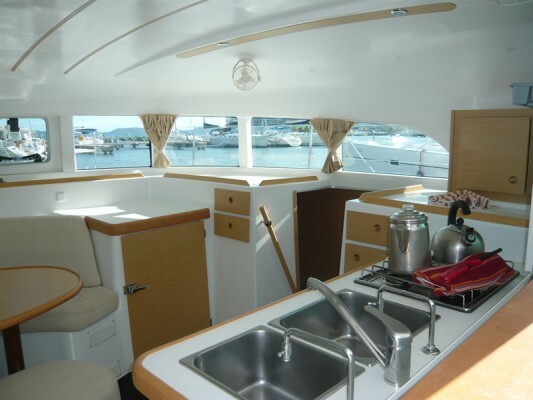 The galley opens onto the cockpit with a sliding window and bar top. 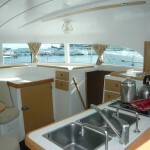 Galley is equipped with a two burner stove w/oven, double sinks, 12 volt refrigerator, ample storage and counter space. 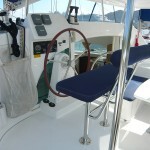 The separate chart table is located to port of the galley. Large hull windows and portholes bath the interior in natural light. 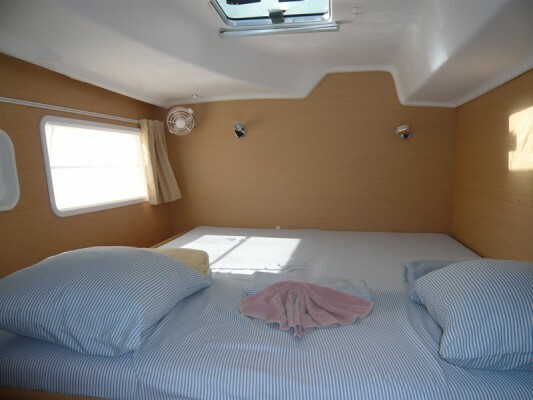 The four guest cabins are beautifully appointed with subtle halogen lighting, cabin fans, opening ports & hatches, soft varnished wood and plenty of storage lockers. 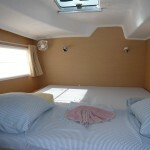 The two spacious bathrooms contain a shower, vanity unit with sink, mirror and head. The cockpit features a large table and bench seats. A hard top bimini protects from the sun. Wide side decks and a rigid walkway on the trampoline make moving about a pleasure. The large trampoline provides a relaxing location for sunning and catching the breeze. Twin step down transoms with a swim ladder to port make access to the water & dinghy easy. 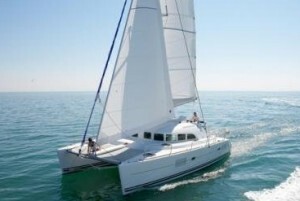 The Lagoon 38 is a stable, non-heeling platform, perfect for both sailors and non-sailors alike.